They used to run the country. Now they're running for their lives! Hail to the comedy chiefs! Jack Lemmon and James Garner win a landslide of laughs as two on-the-lam former Presidents of the United States in "one of the 10 best films of the year" (Bob Fenster, Arizona Republic). Framed in a scandal by the current President (Dan Aykroyd) and pursued by armed agents, the two squabbling political foes plunge into a desperate and delightfully frantic search for the evidence that will establish their innocence. As they scramble through the real America, they get an unexpected crash course in how their policies affected the citizens. With the three leads in waggish form, spirited direction by Peter Segal (Tommy Boy, Naked Gun 33 1/3) and snappy support from co-stars John Heard, Wilford Brimley, Lauren Bacall and more, My Fellow Americans convinces all that comedy is king (and President!). I actually saw this one in the theater when it first came out. I really enjoyed the movie and think it is too bad it didn't do better. The plot is kind of silly, but it is still interesting and entertaining. It does provide a believable enough reason for Russell and Matt to be stuck together. The way the two of them bicker is entertaining. There is a good amount of humor to the movie, most of it from what is happening between Russell and Matt. A bit of the humor is a little on the crude side and could offend some people, but it works for the most part. There is a bit of action in a few scenes that also works. The characters of Russell and Matt both have flaws and can be jerks, but they end up being likable overall. 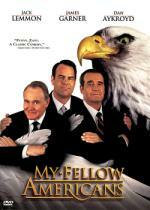 Jack Lemmon and James Garner do work well together and there is an interesting dynamic between the characters. The movie has a few plot issues, but it is fun and entertaining overall. I do think it is worth checking out. Nope..I don't do speeches. Though a few of the characters make some in the movie. This is one of my favorite comedies. Not sure if it's a great movie, but it always makes me laugh. It's also the only movie in my entire collection that I've picked up knowing it was pan-n-scan ahead of time. It was just that funny. Thanks for this review and the comments. I hope you enjoy it when you see it.